I take my high speed internet for granted. 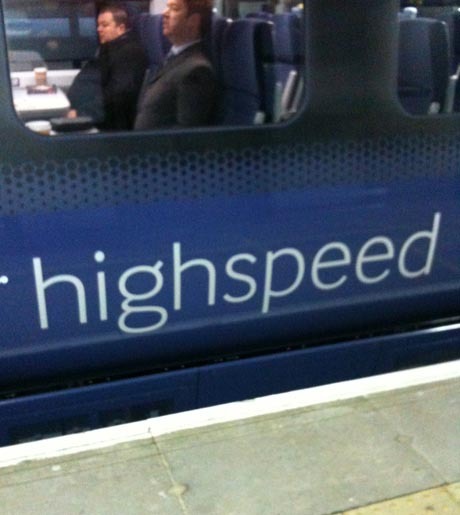 Having just this week lost a modem (they wear out), I was forced to consider my life pre-high speed. How on earth did I survive? Sure, I exaggerate, but really, life before having it seems completely different. 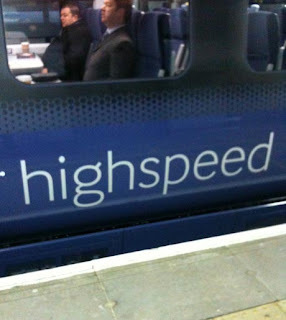 Imagine how improved life would be if we demanded the same high speed from our infrastructure? My husband can attest to this, I've been complaining about the lack of a high speed rail service between Calgary and Edmonton for years. He's probably very tired of this conversation which starts the moment we climb into our car to take the (featureless, flat, boring) 3 hour journey from our home in Calgary to my father in law's home in Edmonton. Imagine doing this by train, I say. Imagine sitting here now, reading a book or flipping through a magazine, checking your email on your iPHONE, oblivious to the dull scenery, sipping a cool beverage, and, God forbid, actually enjoying the trip. Imagine it taking half the time. Imagine cutting back on emissions and congestion. Imagine living like people in the rest of the world! The numerous articles on this topic too many to mention here, include an excellent feature by Monte Paulsen in the June 2009 issue of Walrus magazine entitled Off the Rails, articles in both the Calgary Herald and the Edmonton journal, and even a Facebook group for high speed rail lovers in Alberta. My current favourite Monocle magazine launched its first Global Transport Survey in their June 2010 issue which has enlightening information on what the rest of the world is up to. It is mind-boggling the amount of material written about this topic and yet....and yet....we still have to drive to Edmonton. The world has been enjoying the luxury of multi-modal transportation options, including the high speed train, for a long, long time now. Compared to Japan, who have had high speed rail for almost 5o years, Canada is in the dark ages. The Shinkansen officially began speeding through the countryside of Japan back in 1964, way before the words 'high speed' were associated with computers or transportation and, coincidentally, at the very same time that Canadian trains began phasing out passenger service. The need for speed infiltrated Europe a few years later and they've never looked back. 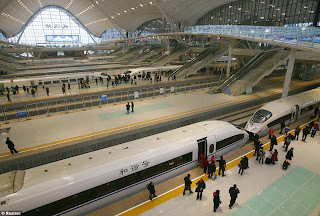 Currently China has jumped on the high speed train wagon, spreading rail lines throughout the country in world-record time. Construction which began in 2005 to connect the business hubs of Guangzhou and Beijing is now complete, with lucky riders boarding the train today as I write this blog posting. As the Chinese were expanding their extensive rail system, Alberta was deep into study-mode, gaging the feasibility of a Calgary/Edmonton corridor high speed rail service (HSR) for the umpteenth time. In fact, in the time it took us to ignore some key findings from important studies like the one conducted by the Van Horne Institute, China had already completed the Guangzhou/Beijing line. In the time it took us to say 'maybe we need one more study', high speed rail systems throughout the world were being built. Which begs the question, when exactly will we be ready to enter the 21st century? The irony that Canada was built on the railroad, one of the prevailing dreams of Sir John A. McDonald and gang, is not lost on me. The fact that Canada was able to construct a transcontinental railway in the 1880s, from sea to shining sea, through the Canadian shield and the Canadian rockies, and the fact that Canada is the home of a world-renowned train builder, Bombardier, makes it even harder to take. 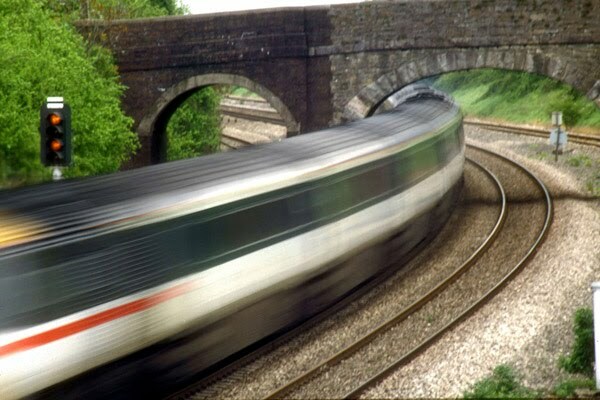 We could have a home-grown, world class, Canadian-made high speed train if only we could change our attitude. It does seem to come down to that, and political will, which often reflects public attitudes. Some would argue that it is about money, but when did that stop us from building highways or the original CP Rail for that matter? Just think, we were able to fund and carve out spiraling train tunnels through mountains over 100 years ago. This super feet of engineering was by far the longest and most impressive railway ever constructed at the time. Why then today are we so adverse to putting money into public transportation like a HSR in our province? In a time when the entire global population is aware of the necessity to wean themselves off an ever-present oil dependency, when the prospect of relying on private automobiles alone to get you around feels like something out of a Leave it to Beaver episode, why on earth are we afraid of the train? The money needed to build a high speed train is not insignificant but what long term public infrastructural system ever is inexpensive? Especially one with so many obvious benefits? Many argue that the time to invest in public infrastructure programs like this is in a recession – something like we are in now for example, if nothing else because construction costs are lower and it's a great way to create jobs. Even die-hards who don't care about the environmental benefits of trains, can't argue with job creation! It's important to remember that even the CPR of the 1880s quickly turned a profit and so were able to repay loans to the federal government years ahead of schedule. Sifting through the list of findings from the 2004 Van Horne Institute's study on high speed rail in Alberta is both informative and frustrating. It's informative as it gives a great overview of history, context, financial, environmental and socio-economic benefits of building an HSR in the Calgary/Edmonton corridor along with possible rail system options (a retro-fit of current CPR tracks, or a totally new Greenfield electric and a non-electric version) and frustrating in that it was completed 6 years ago!! (side note: the study mentions that it would take approximately 6 years to build the system). In the time it took us to ignore the study results which were pointing positively in the direction of a high speed train, we could have completed the project and been comfortably and safely zipping through the Alberta countryside in high style. It's interesting to note that the Van Hornes have been involved with rail building in Canada since the mid 1880s, when Sir William Cornelius Van Horne was the executive director of the Canadian Pacific Railway (CPR) whose job it was to oversee the historic build across Canada. I wonder what he would think of modern day Albertans? Our stubbornness, our near pathological blindness of the changing world around us, would be baffling to someone like him. He might be impressed with our internet connections, but for the rest, he would be sadly disappointed. High speed internet is a must, currently I am using Acanac, so far their service is impressive, no downtime at all.